Thanksgiving is my favorite holiday. Fall, food, friends and family, and acknowledging and giving thanks for all we have. There is also history related to Thanksgiving that we can share with kids. Spanish Thanksgiving activities for children tap into this tradition and information. Kids can learn new vocabulary and practice different skills as they prepare for the big celebration. These some of my favorite Spanish Thanksgiving resources. As Spanish Playground continues to grows, I know that it can be hard to find what you need. 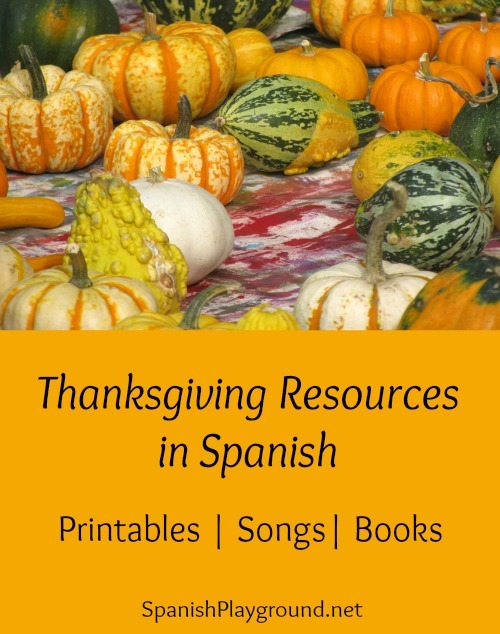 I have organized these new Spanish Thanksgiving resources and ones from earlier years to make it easier. Spanish Thanksgiving words include vocabulary for giving thanks as well as vocabulary to talk about the holiday. You can find a Spanish Thanksgiving vocabulary list here. There are activities for practicing the words such as matching words to pictures, ordering syllables to make a word, and ordering words to make a sentence. This short video is about giving thanks and being thankful. I like it because it gets to the true meaning of the holiday in simple, easy to understand Spanish. It’s perfect for preschool or elementary school. This video is also about expressing thanks. It is an easy conversation about receiving a gift of flowers. There is basic vocabulary, including color words, and a heartfelt thank-you. These two short Spanish Thanksgiving poems use very simple props. The actions for acting them out are in the post. One poem is about a turkey and the other is about Thanksgiving dinner. They are a big hit with my students! These Spanish Thanksgiving songs teach language and also help kids express their appreciation for what is most important. This is a wonderful Thanksgiving song by Music with Sara. Adding actions to songs is fun and helps children learn language. Yo soy un pavo by Spanish Together is perfect for our littlest Spanish learners to sing with gestures. Te damos las gracias Señor por las manos is a religious song and often sung as a part of presentations at school in Spanish-speaking countries. If it is consistent with your beliefs and appropriate to your teaching situation, you might like to share it with kids. José Luiz Orozco has a wonderful new song on his CD ¡Come bien!. It is called Damos gracias and we sing it with maracas. These Spanish Thanksgiving printables use the celebration to teach different kinds of vocabulary. These 2 color-by-word turkeys are a fun way to practice colors in Spanish. Kids learn vocabulary associated with the first Thanksgiving with this Spanish Thanksgiving story activity. The very simple story is told with pictograms in the text. Spanish Playground has a set of Doy gracias por… coloring pages for different vocabulary themes. Each coloring page has pictures labeled in Spanish. There are coloring pages for general vocabulary, food, body parts, animals and colors. There is a Spanish Thanksgiving coloring page for transportation, too. With this Spanish Thanksgiving minibook from Monarca, kids practice simple sentences with Doy gracias por and common vocabulary. Many of our typical Thanksgiving foods, from pumpkins and potatoes to corn, originated in Latin America. Check out these resources to learn about food from Latin America. There are picture cards, an infographic, and a video. Nourish Interactive has a many free printable materials in Spanish for Thanksgiving including coloring pages, word games, bookmarks, lunchbox notes, dinner place cards and a organization sheet to help with Thanksgiving planning. These Spanish gratitude journals are also an excellent tie-in to the Thanksgiving holiday. Kids draw on the language in books they read to reflect on what they are grateful for. This section contains Amazon affiliate links. If you click through and make a purchase, Spanish Playground receives a small commission. Gracias/Thanks by Pat Mora is a beautiful picture book in Spanish and English. Sol y Canto have recorded part of the book in the video below. The book is available in many libraries and also from Amazon. Gracias/Thanks was selected as a 2010 ALA Notable Book and has won many other awards. Celebra el Día de Acción de Gracias con Beto y Gaby and Pavo Por La Cena De Gracias? No, Gracias! / Turkey for Thanksgiving Dinner? No Thanks! are both by Alma Flor Ada. They are wonderful books for talking about the meaning of Thanksgiving. Dar las gracias by Sharon Coan and El primer Día de Acción de Gracias by Amy White are both for beginning readers. They have limited text well supported by pictures, making them a good choice for Spanish learners. Día de acción de gracias by Rebecca Rissman is part of the Fiestas series. It is another good non-fiction choice for kids learning Spanish. There are also games, crafts and other activities to teach kids about Thanksgiving in Spanish. These suggestions focus on teaching natural world vocabulary. This is a wonderful game and craft combination for talking about gratitude and teaching language. Kids love it! Here are 5 Spanish Thanksgiving crafts you can do with language learners. They all incorporate Thanksgiving vocabulary. Talking about photos is an excellent language activity. Try it using the questions that follow this picture of a huge turkey in a Thanksgiving parade.